Yeah! Flags #1 is done. 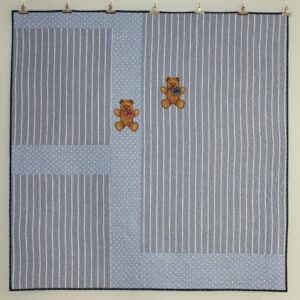 There were two extra bears that found a home on the back of the quilt. The plan was to make a quilt sandwich for Flags #2 today, but it didn’t happen. I think that I will have time to do that on Sunday afternoon. The inside of my head feels like a pinball game – I have so many different ideas bouncing around. 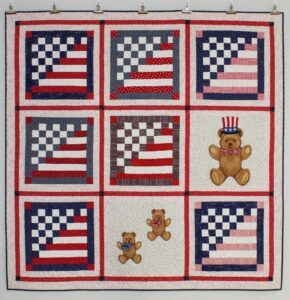 I need to make decisions for the Lincoln quilt, layout for a pieced Dresden plate quilt and changes to Black, White & Bright (American Patchwork & Quilting June 2015). Somehow it will all work out, it always does.